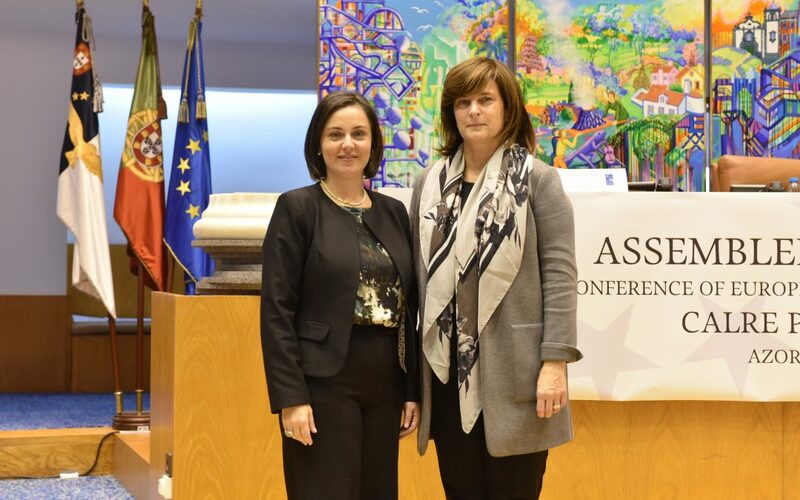 Donatella Porzi, President of the Legislative Assembly of Umbria, was elected unanimously, as President of CALRE for 2019, at the Plenary Assembly of CALRE, that took place today in the city of Horta. In her first speech, President Donatella Porzi began by thanking everyone that were by her side in her path and the confidence that the Plenary Assembly gave her in this new journey, stating her commitment in paying the appropriate attention to the sensitivities that legitimately lead the community and territorial debate, acknowledging the due respect to the history and the evolution of the regional parliaments in the several member-states of the Conference. The President of the Legislative Assembly of Umbria also highlighted that she is looking, whenever possible, to raise the bar in the belief that the politician should also aspire ambitious results to achieve the objectives established, that is why, in total compliance and deep respect for the Rules of CALRE and the values in them expressed, she will devote her utmost efforts and the Assembly that presides to an inclusive mandate. Born in Perugia on 27th March 1966, is married and mother of two children. She graduated at the ISEF of Perugia and was a high school teacher. She was, between 1990 and 1996, voluntary assistant of the gymnastics and games for children course at the ISEF of Perugia and belongs to the technical staff of the Coni provincial since 1996. Member of the party La Margherita since 2004, and, in that same year, she was elected Cannara’s Town Councillor and education, youth and social politics adviser. She was elected to the Democratic Party and to the Regional and Provincial Assembly of the DP, in 2007. She was provincial councillor of cultural, social and youth politics, European policies, legality and equality of opportunities, from 1st July 2009 to 12nd October 2014. She is the President of the Legislative Assembly of the Region of Umbria since 10th June 2015. Donatella Porzi, Presidente da Assembleia Legislativa da Umbria, foi eleita, por unanimidade, Presidente da CALRE para o ano de 2019 na Assembleia Plenária que decorreu hoje na cidade da Horta. No seu primeiro discurso, a Presidente Donatella Porzi começou por agradecer a todos os que a acompanharam no seu percurso e enaltecer a confiança que a Assembleia Plenária da CALRE depositou nela para esta nova jornada, assumindo, por isso, que se compromete em prestar a devida atenção às sensibilidades que, legitimamente, animam o debate comunitário e territorial e reconhecendo o devido respeito à história e à evolução dos parlamentos regionais nos vários países membros da Conferência. A Presidente da Assembleia Legislativa da Umbria sublinhou, também, que procurará, sempre que possível, elevar a fasquia na crença de que o político deve aspirar a resultados ambiciosos para alcançar os objetivos estabelecidos, pelo que, em total consonância e profundo respeito pelo regulamento da CALRE e valores nele expressos, dedicará o seu máximo empenho e o da Assembleia a que preside, a um mandato inclusivo. Nascida em Perugia a 27 de março de 1966, é casada e mãe de dois filhos. Licenciada no ISEF de Perugia, foi Professora do Ensino Secundário lecionando, entre 1990 e 2000, em diferentes instituições de ensino na área da atividade física e motora. Desde 2004 que é membro do partido La Margherita e, nesse mesmo ano, foi eleita Conselheira da Cidade de Cannara e assessora de educação, juventude e políticas sociais. Em 2007, foi eleita para o Partido Democrata e para a Assembleia Provincial e Regional do PD. Entre 2009 e 2014, desempenhou funções como Conselheira Provincial de políticas culturais, sociais e juvenis, políticas europeias, legalidade e igualdade de oportunidades. Foi eleita Presidente da Assembleia Legislativa da Região de Umbria a 10 de junho de 2015.